A couple of days after the official start of hurricane season, Tropical Storm Colin formed in the Atlantic Basin. Colin became a named storm on June 5 and is the third earliest tropical storm to form on record in the Atlantic Basin- according to the NWS National Hurricane Center. Hurricane season started on June 1, 2016, but those who live in the southeast experienced a few pre-season storms. Hurricane Alex formed in the eastern Atlantic Ocean January 2016. Tropical Storm Bonnie drenched the Carolinas during Memorial Day weekend. NOAA predicts a near-normal season with 10-16 named storms, 4-8 hurricanes, and 1-4 major hurricanes. NOAA stated this season is particularly difficult to forecast due to the uncertainty of climate factors. El Niño is dissipating and NOAA’s Climate Prediction Center is forecasting a 70 percent chance that La Niña — which favors more hurricane activity — will be present during the peak months of hurricane season, August through October. NOAA will issue an updated outlook for the Atlantic hurricane season in early August. A SECOORA and US IOOS funded buoy, C12, in the Gulf of Mexico is capturing Tropical Storm Colin in real time. Around 1pm, winds were gusting to more than 60 mph and currents are ripping a bit over 50 cm/s. The buoy is part of the University of South Florida’s Coastal Ocean Monitoring and Prediction System (USF COMPS) program. Click here to explore the data. Contact Bob Weisberg, USF College of Marine Science, for more information. The Tampa Ports system in Florida was recording winds of 25 knots sustained with gusts to 35 knots. Waves off the mouth are 8.1ft from the SW at 8 sec. Water levels have crested at 4.8ft and are going down. Click here to explore the data. Contact Mark Luther, USF College of Marine Science, for more information. Below are some resources for you to watch the storm and it’s effects. SECOORA plans to update resources for each storm this season. The SECOORA Data portal is a tool to explore, download and visualize ocean and coastal data in the SECOORA domain. When a storm is approaching, check out the sensors map to see the storm data in real time. The Marine Weather Portal provides marine observations, forecasts and short and long-fuse warnings for the coastal waters of North Carolina, South Carolina and northern Georgia and the Atlantic and Gulf Coast areas of the Southern Region. Click here to access the MWP. Please note the MWP will be upgraded next year. USF COMPS consists of an array of instrumentations along the West Florida Shelf. 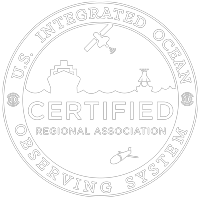 The data collected supports the a variety of management issues, including more accurate predictions of coastal flooding by storm surge, safety and efficiency of marine navigation, search and rescue efforts, and fisheries management. . Buoy data from C12 in the Gulf of Mexico is pictured on the right. Access data here. StormTrack allows you to see the latest predicted track of an identified storm. By using our wealth of real time observations, meteorological tools, and precision models, you can see exactly how each storm is progressing. Each storm page grants access to premium level data for the duration of the storm. Click here to access the StormTrack. As a Weather-Ready Nation Ambassador™, SECOORA is committed to working with NOAA and other Ambassadors to strengthen national resilience against extreme weather. Click here to read more about WRN. Explore SECOORA partners and member organization hurricane support resources by clicking here.